In my search for the perfect strawberry, I went to talk to strawberry growers Grant and Heather Kane, at their farm south of Cambridge. Kane’s strawberries have a great word-of-mouth reputation. They are reliably excellent in quality and they are often sold out at the farmers’ market. At mid-week in early December they had a steady stream of customers dropping in to buy kilo boxes of berries for making jam. I love strawberries, and two things are most important to me. The first is the flavour and scent of a freshly picked, perfectly ripe strawberry – that gorgeous balance of sweet-sour-fruity-aromatic. The second is concern about toxic spray residues. So, when I heard the Kanes mention that they were using organic sprays on their strawberries, my ears pricked up. It’s wonderful to find experienced growers like the Kanes taking a step like this. Boxes of Kane’s strawberries, demanding to be eaten. This photo courtesy of Kane’s. Strawberry flower photo at top of page by Dani Edwards. 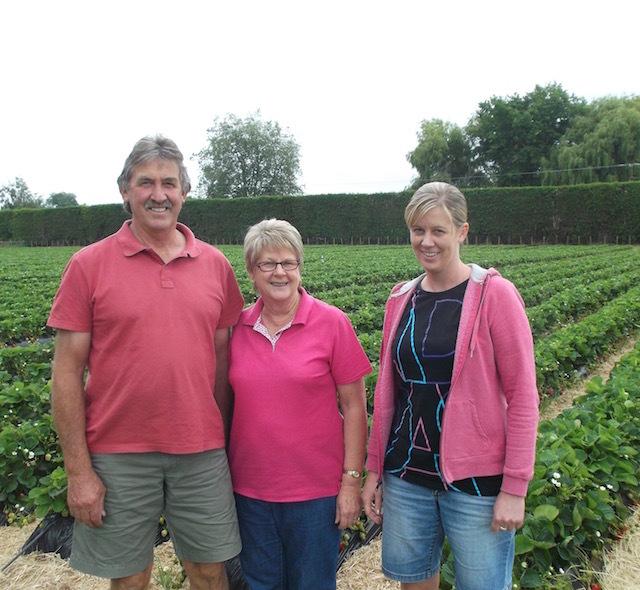 The Kanes have been growing strawberries on their 10-acre block for more than two decades. They also grow nashi. 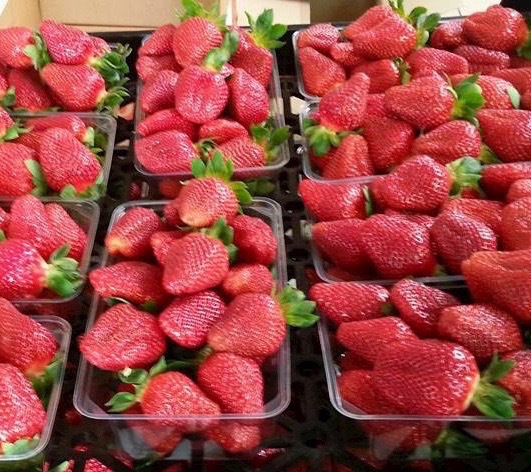 They used to export, but found it frustrating that they had to pick the strawberries before they were fully ripe, and they knew the quality wouldn’t be ideal. “We’ve always been passionate about having a good product,” Heather said. (Exchange rate fluctuations weren’t great either.) So they decided to focus on growing for the local market. 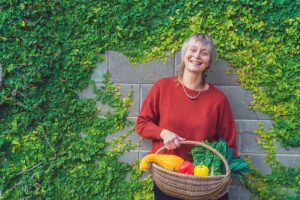 When the farmers’ markets started up, it was perfect timing for them. They enjoy the social aspect of the markets and the contact with customers. Grant and Heather are delighted that their daughter Emma has recently returned to help them in the business, after several years working as a vet nurse on the Gold Coast. They also have a great team of pickers and packers, some of whom have been working for them for 20 years. The staff are encouraged to taste the fruit as they work – that’s an important way to make sure the quality is maintained. The Kanes enjoy eating strawberries, but in the season they’re far too busy to do much cooking. Grant likes Eton Mess – strawberries, whipped cream and crumbled meringue, sort of like a deconstructed pavlova. Strawberries with Cointreau is Emma’s favourite. And Heather recommends strawberry and apple pie. Make an apple pie in your usual way, but add some sliced strawberries to the apples before you put the top crust on. The strawberries and apple combine really well, Heather says. NB Don’t try to make this on a large scale, or you may have problems with setting. Cook up one or at most two kilos of strawberries at a time. Place strawberries in a saucepan. Warm them on a gentle heat, then mash. Measure the strawberry pulp and add the same amount of sugar. Bring slowly to a boil, stirring all the time. Boil for about five minutes, then add the juice of two lemons. Boil for another eight or so minutes, until the jam sets. Pour into sterile jars and seal.